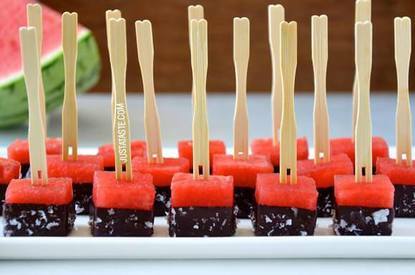 The bite-sized servings of watermelon go for a quick freeze before being dunked in your choice of melted chocolate and finished with a sprinkle of sea salt. Remember that the better quality of chocolate you use, the better these sweet and salty bites will taste. And feel free to swap sprinklesfor the sea salt, or add some extra crunch with chopped nuts to round out this easy, refreshing and healthy dessert.